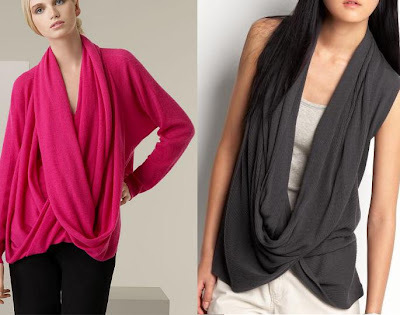 Recently I noticed a new drape trend that I am find casual and stylish. Of course not all drapes are created equal. Although I find certain pieces stylish, some just look plain slouchy and slightly sloppy. I have gotten couple drape pieces last season and I love how the right drape can nip and tuck all at the right places, especially around the tummy area. ~ smile! I have a few dress that have the most beautiful drape around the abdomen area which hides my bloated stomach at the end of a big dinner! -left Vivienne Westwood --- This looks too slouchy and sloppy for me. -right Drape vest $79.50 via Banana Republic --- I adore the casual chic slouchy look. Both pieces look too comfortable. I likey! Do you like this trend? Have you been drape yourself yet? oh i love draping for spring, so beautiful! I adore ! So chic ! Draped pieces are so effortless and elegant. Great photos! Hi there-lovely picks, I love the draped effect. My Issey Miyake jacket that I thrifted is the only piece I have, but I would love a dress!! I'm a big cowl neck fan. Banana Republic has some great drapy neck tops. I'm a big fan of draping! I love the draped look. 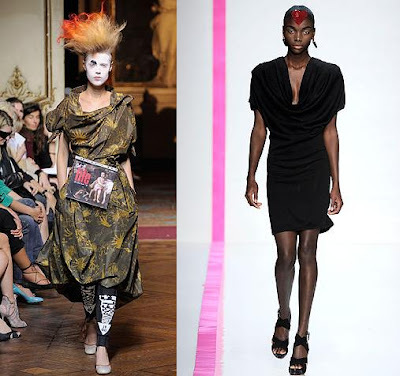 I've noticed about my style that for work I am about tailoring and structure. And then when I'm being casual, I go for unstructed, draped things. The givenchy is gorgeous. Difficult color though (or for me at least). The donna karan, banana, black halo, and the Illia are great as well. I love those lllia pieces... just the right amount of draping for my taste. I love this look, but it looks difficult to wear! I don't think I could figure out what goes where, haha! Loving this look...the DK piece is gorgeous SG! I really love that Givenchy dress. It is the best! i love this Givenchy dress, sweetie. Thanks for the tip on buying dress with drapes. I like the last vest. I love the Givenchy, so gorgeous! Draping is awesome, but you're right in that it can be a bit tricky to find the draping that works for you. My fav of your picks is the BR option as it looks like the one that would look great on everyone! I love drapey things. I like the Ann Taylor cowlneck dress, but i'm hating that it's wool! So itchy! The NYC indie designer I just featured used draping as well - I think it works if it is done with some type of structure (unlike Ping's last design from Project Runway - sheesh!). The Givenchy has my name written all over it! The gray Givenchy dress is absolutely killer!! Love these. I love draped skirts...but you have to be careful with draped clothing, it doesn't work for every body type.